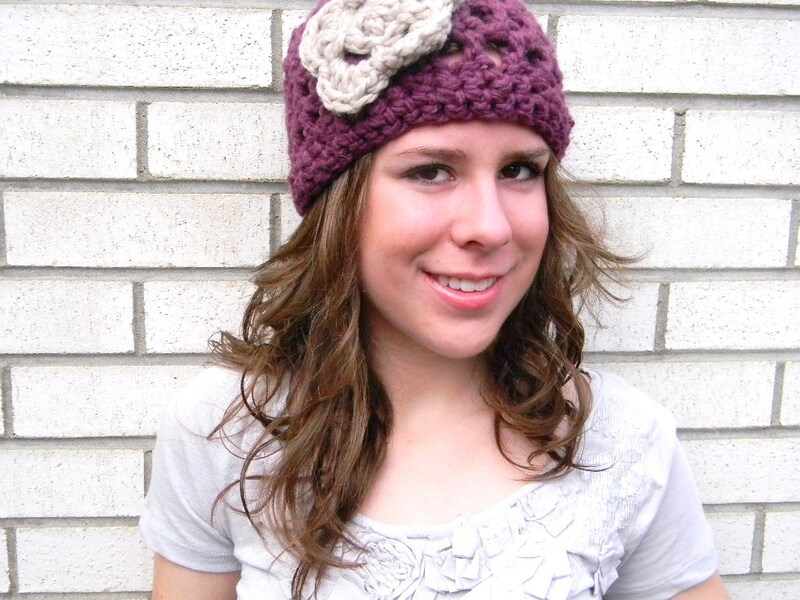 Use this free crochet hat pattern to create your own crochet hat in a few hours. Made with SUPER bulky yarn and with only 9 simple rows in the pattern, this hat pattern will have you lookin’ good in no time. The crochet pattern is named after my good friend (and future roommate! ), Rachael. This hat is crocheted in an open weave so it’s suitable for those below zero temperature days, but it’s chic and fashionable nonetheless. Because Rachael is eternally classy and always hot temperature wise, this is her perfect hat. Gauge: First 2 rows in pattern = 4.5 inches in diameter. Take time to check gauge. Adjust needle size if necessary. Round 1: Ch 3 (counts as first dc now and throughout). 11 more dc into ring (12 dc). Join to top of turning ch with sl st and at the end of each round. Do not turn. Round 2: 2 dc in each st around (24 dc). Round 9: Sc in each st around (40sc). Fasten off. Using darning needle, weave in ends. Round 1: Ch 3, 9 more dc into ring (10 dc). Join to top of turning ch with sl st. Round 2: Chain 4 (counts as 1 sc + 3 ch). * Skip next st, sc, ch 3 *. Repeat from * to * around. (Five, ch-3 spaces) Sl st in first ch-3 space to join round. Round 3: Ch 1. In first ch-3 space, work 4 dc, 1 sc. In each ch-3 space work *1sc, 4 dc, 1 sc*. Repeat from * to * around to create 5 petals. Sl st to first ch to join round. Fasten off, leaving a 10 inch tail. Using darning needle, sew flower to left side of hat. You’re welcome, Thea – I hope you enjoy the pattern! Glad to hear you like it, Jackie. I hope you get a lot of use out of the pattern. I love Craftster too and appreciate all the creativity and community. Let me know how your hat turns out! Thanks for the pattern! I ended up doing rounds 4+ a bit different because I crochet at a weird gauge but the hat turned out really nice. Love this hat! Thanks for the pattern! Thanks for the pattern. I would like to make one for my 4 yr old daughter and her head is 19″ around versus mine which is 21″. Is there a way to make this hat fit her? Let me know any tips. I’m quite new to the crochet world. Not sure if I would just skip a few stitches in the beginning rounds to make it smaller. Hi Kristin, welcome to the world of crochet! Yes – you are absolutely right about how to down-size the hat. In order to make the hat for your daughter, I’d start with fewer stitches in the fist round (maybe 10 instead of 12) and follow the pattern as written, for only Rounds 5-6. I’d omit Round 7 entirely to make the hat shorter for your daughter, but still crochet the two rows of single crochet as written (Rounds 8 – 9). Hope that made sense. Good luck and let me know how it turns out! Thanks much for the cute pattern, likely my next project! I’ve been crocheting for about a year and find it sooo hard to find cute, hip/stylish looking projects. Love a lot of what you have, thaniks for sharing with us!! Great hat, really like it. I made one, and what I noticed, the hat was a little too short in the length, so I added another sc row at the end. It just fits on top of my ears. But I loved how easy the pattern was to follow. I had to change my crochet hook (to N), because when I measured the first 2 rows, I was only at 4 inches. I did not have a M hook. Still the hat came out great! Love the flower also! Thanks for sharing this super easy pattern! I’m glad you enjoyed the pattern, Kathy! Sometimes when I make these hats they turn out a bit too short (I find Lionbrand’s yarn sometimes varies in thickness), so I add an extra row. I agree – the extra row gives the hat a little more length and to keep ears toasty. Thanks for the comment! Love the hat but I’m a bit confused–Do rounds 4-7 increase? I tried the pattern-twice, one time w/ a P hook (not w/ bulky yarn) but the hat still seemed very small. No, Rounds 4-7 of this hat don’t increase. After you work the increases in Round 2, you make the final increases in Round 3 by working *DC, ch 1* in each stitch around. Round 3 creates 24 double crochets and 25 chains which you keep working across for Rounds 4-7. At the end of Round 7, you should still have 24 dc. I think the problem you might be having is with the bulky yarn – the bulk is what makes the hat! If you use regular yarn–even with a P sized hook-your hat will come out too small. Try bumping up the yarn and you should be good. Let me know how it turns out! Totally love this hat pattern!!! 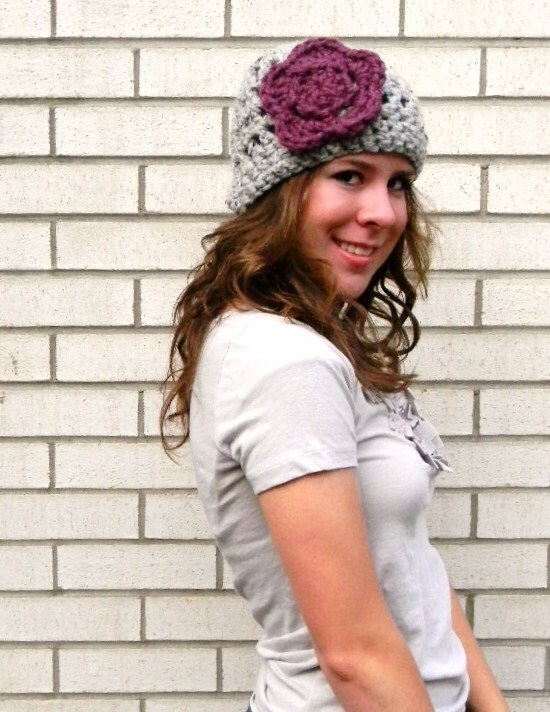 I made it last weekend with some leftover bulky yarn, and it was sooo easy and super-cute. I’m a teacher, and when I showed some of my fellow teachers the hat, a few were inspired to start learning crochet. We’ve started an unofficial little crochet club during our lunch time, and it’s been so much fun to teach my friends to crochet with such an easy pattern! Plus, now we’ll all have matching hats! So glad you’re getting good use from the pattern, Erin! That’s awesome that you’re teaching your friends to crochet – You share that crochet love! I figured it out!!!! Made one for me, one for my daughter, and even an infant one for my nephew (put an owl on it instead of a flower) Thank you! Glad you figured it out, Crystal – sorry I didn’t respond to your question sooner. Your whole family is going to look so cute in this hat… Stay warm! So quick question, could I make this for a 8 month old baby girl? Do I just do fewer rows and increases?.. I love this! I’ve made 2 hats following your pattern and mine turn out so strange looking. They’re almosy square-ish. Do you have any tips. Maybe I’m just not doing it right. Mine are never ling enough. They come down to just above my ears. Yes, Karina – I’d start out with fewer stitches in Round 1 (maybe 8 or 9) and work fewer overall rows so the hat’s not down over the 8 month’s eyes. Sorry you’re having trouble with the hat. It sounds like your hat gauge is the issue. After your first 2 Rounds, are you ending up with a circle that measures 4.5 inches in diameter? If not, you might have to increase your hook size. If that’s not the case, I’d say just crochet an extra row or two onto the end After Round 9 so the hat’s a good length for you. Let me know how things go! 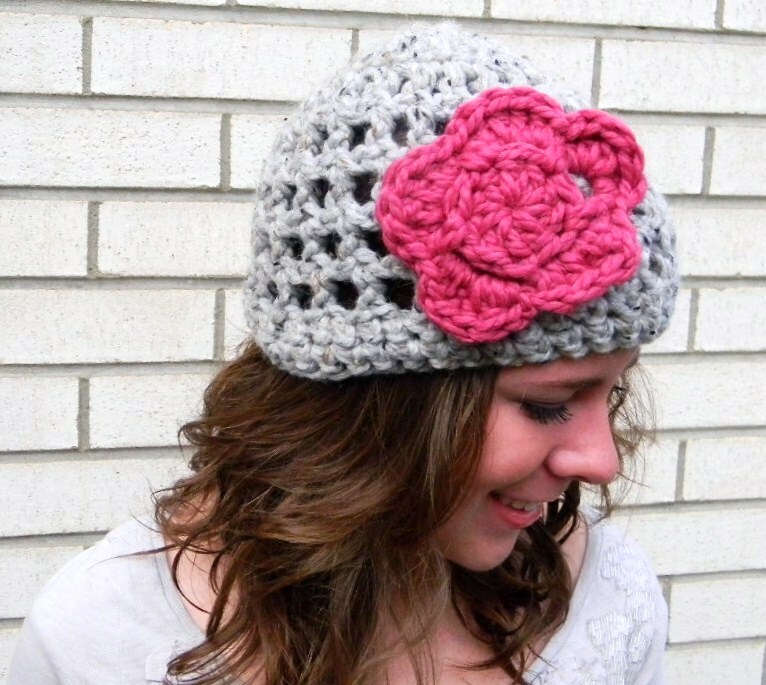 Beautiful hat and flower, which I hope to crochet – with your help. I am new at this, so can you please explain: join to top of ‘turning chain’ in row 1? Am I supposed to turn at some point? This is the perfect pattern to use up that stash, ha. Cute, chunky, and works up so quickly. Enjoy! Hi there, You actually don’t “turn” anywhere in the pattern. I called it the turning chain because that’s what it’s commonly referred to as, though I guess it makes more sense when you’re reading a pattern that actually requires that you turn your work! I guess you can think of it as more of “join to top of beginning chain” instead of the turning chain. Thanks for pointing that out! I have been teaching myself to crochet for about 2 months and this is the fastest and cutest project I have ever made (done in 1 hour) , finally something for mommy to wear! Super cute, thank you. Thanks for sharing your pattern! 🙂 I love to make hats and this one is cool. I love working with chunky yarn. After searching for a bulky yarn hat pattern, and being disappointed with every one I tried, I found yours and LOVED! it! Worked up so quick! Thank you! Obsessed with this hat!!!! Just wondering if the flower is also made from bulky yarn? Hoping my mom will teach me how to do this soon! Especially love the grey/purple combo. Thanks for the free pattern! Jayna! Always love your patterns! Thank you for posting this one. I’m not sure if I used a little less chunky yarn or if I just have a tighter stitch, but I added 3 additional rows to the body of the hat and it worked out perfectly! 🙂 Thank you again for sharing! Thanks so much for the awesome pattern! made quick and easy for perfect Christmas gifts! Love this pattern exactly what I was looking for,just got back into this after 20 years ,ty for sharing! Thanks for sharing the pattern. I loved it and i made the hat in less than 4 hrs. It is my first crochet hat and it is awesome. Thanks a lot …..
is there a way to do it with a yarn like red heart? I have a lot of it laying around just figured id ask! THANKS! Do start round 2 with a chain or anything? I love this pattern. I modified it to be small enough for my friend’s baby, and It only took me about 30 minutes to make! I absolutely love this hat! I made a couple for my friends’ birthdays, and was so happy with how they came out that I had to make one for myself too =). Once my friends got home (they were visiting in MA from FL), they showed them off, and now I have some of their friends asking if I could make some for them too! (Seems like a perfect Florida hat to me- not too warm, but just enough for the cool days!) It’s such a great hat, easy to follow pattern, and works up quick- thank you!!! Thanks so much for the awesome pattern! My 10 year old daughter and I are going to make some for our family for Christmas.